In case you couldn’t tell, I have a bit of a craving for chillies at the moment. Dragon chicken is an Indo-Chinese dish that definitely delivers on this front and consists of battered chicken stir fried in a spicy chilli sauce. The sauce has a lot of flavour from the garlic, ginger and soy sauce while the dried red chillies deliver a fiery kick. You can adjust the amount of chillies and chilli paste based on your taste. If you like a milder dish, you will want to use significantly less but then you won’t really be making dragon chicken. This is quite a dry dish. The sauce should be just enough to coat the chicken so if you want more then, by all means, double the sauce ingredients. The chilli paste can be bought readymade but is easily made by soaking dried red chillies in hot water and then grinding to a paste. They give the dish an amazing kick. If you are not a spice fan then this recipe is probably not for you. If however, you can’t get enough of it, read on. Take chicken in a bowl and add all the marination ingredients. Mix well and let it marinate for 15 minutes. Now heat some oil for deep-frying. When the oil is hot drop the chicken in oil and fry till golden. Drain and set aside. Now heat oil in a frying pan. Add in dry red chilli and cashews and fry till the cashew turn golden brown. Now add in onions and bell peppers and toss well in the oil. Now add in the fried chicken and toss well in the sauce. Add in chopped coriander or spring onion and mix well. Gochugang is a deep red fermented chilli paste that has a nice deep dark flavour (not too much heat, with a little bit of sweetness). It is pretty readily available in Asian grocers and most large supermarkets now. The sauce is rich and spicy with a hum of garlic and fresh ginger while the drizzle of honey helps to balance the heat and the black sesame seeds and/or peanuts add a nice nutty flavour and crunch. The crispy batter, succulent chicken and deep flavour of the sauce will have you disgracing yourself as you destroy the lot but don’t worry, you won’t be the only one. If, like Marilyn Monroe and I, you like it hot then add a little gochugaru (Korean chilli powder) to the sauce for extra lip-smacking goodness. 1. Preheat oil to 180°C. 2. For the spicy Korean bbq sauce, place all ingredients into a milk pan and whisk together over a gentle heat for a few minutes to dissolve the sugar and infuse the garlic and ginger. Set aside. 3. Sift together the flour and cornflour into a mixing bowl. Whisk in water until fully incorporated and no lumps remain. 4. Dip each nugget piece into the batter and shake to remove any excess. Carefully drop each battered nugget into the hot oil and fry for 5 to 6 minutes (this will have to be done in batches). 5. Drain onto paper towels and season with salt and pepper. Once all nuggets have been fried, place nuggets back into the fryer and fry a second time (double fry) for 5 to 7 minutes or until light golden brown and crispy. Lightly season with salt and pepper. 6. Pour some of the Korean bbq sauce into a heatproof bowl and thin out with a few drops of water. Add the nuggets and toss together in the sauce to coat them. Transfer them onto a serving plate with a slotted spoon and garnish with black sesame seeds or crushed peanuts and a drizzle of honey or more Korean bbq sauce. I absolutely love rolling my sleeves up in the kitchen to undertake a big Indian feast. Nothing pleases me more than mixing the fresh spices, toasting and grinding them to create beautiful aromas and tastes. But sometimes, there isn’t always time in the day to get so hands on as less important tasks such as the day job get in the way. That doesn’t mean that a wonderful Indian meal is out of bounds though. With the help of a jar of curry paste, you can whip up a delicious curry in about 15 minutes. I’d like to urge that this recipe uses a curry PASTE and not a curry SAUCE. Ready made curry sauces are full of sugar and additives and don’t taste anywhere near as good as a freshly prepared curry. Paste, on the other hand, is a perfectly selected blend of freshly ground spices with the addition of ginger and garlic which are immediately preserved in vegetable oil so that the air does not get to them and alter their flavour profile. Heat the oil in a large pan. Add the ginger and garlic and fry for 30 seconds. Add the curry paste and fry for a further 2 minutes until it looks like it is splitting from the oil. Add the prawns to the pan and stir fry over a high heat for 3 minutes until pink. Add the creamed coconut and hot water and stir every now and then until the coconut had melted. Simmer for 1 minute. Mix the coriander with the red chillies and spring onions. Stir into the prawns and serve immediately. This is great served with rice and chapatis and even more fresh coriander. 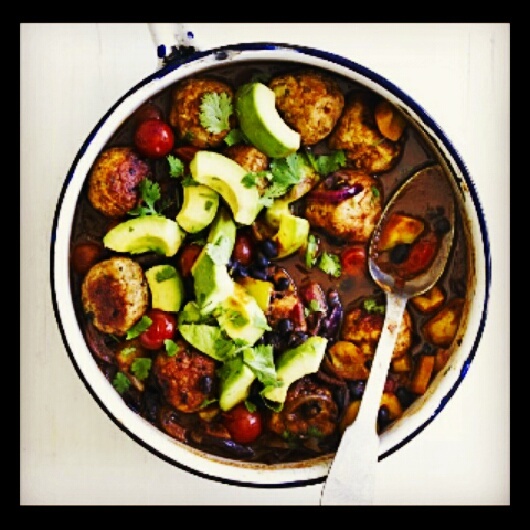 A different take on a classic chilli with spiced meatballs in a smokey sauce with creamy, zingy avocado to top, this recipe is a real crowd pleaser. First make the meatballs. Tip the mince into a bowl, add the oats, spring onions, spices and the coriander stalks then lightly knead the ingredients together until well mixed. Shape into 12 ping-pong- sized balls. Heat the oil in a non-stick frying pan, add the meatballs and cook, turning them frequently, until golden. Remove from the pan. Tip the onion and garlic into the pan with the pepper and stir-fry until softened. Stir in the cumin and chilli paste, then pour in the stock. Return the meatballs to the pan and cook, covered, over a low heat for 10 minutes. Stir in the tomatoes and beans, and cook, uncovered, for a few minutes more. Toss the avocado chunks in the lime juice and serve the meatballs topped with the avocado and coriander leaves. Serve with rice. I have a taste for lentils at the moment and teamed with my love of all things Indian, lentil curry seems a great choice. Lentils have a bit of a reputation for being boring and bland but each variety has it’s own subtle flavour and this mix creates a wholesome and earthy taste bought to life with fresh ginger, spices and chillies. You can serve this as a side dish to a meat curry but it is plenty tasty enough to stand up on its own. It is great served with chapati, roti or paratha. The night before you want to serve the dal, rinse all four types of dal well then combine them in a heavy-based pan about 25cm in diameter. Pour in 2 litres of water and leave to soak overnight. The next day, place the pan over a high heat and add the onions, ginger, chilli, butter, salt and turmeric. Cover and bring to a boil, then reduce the heat to low and simmer at a gentle bubble for about 2½ hours, stirring occasionally. Add the garam masala, mix thoroughly, cover and continue cooking for 15 minutes. Serve immediately. For an extra kick, heat some oil in a small pan, add cumin seeds and fry for 10 seconds and then add two whole dried red chillies and fry until they darken. 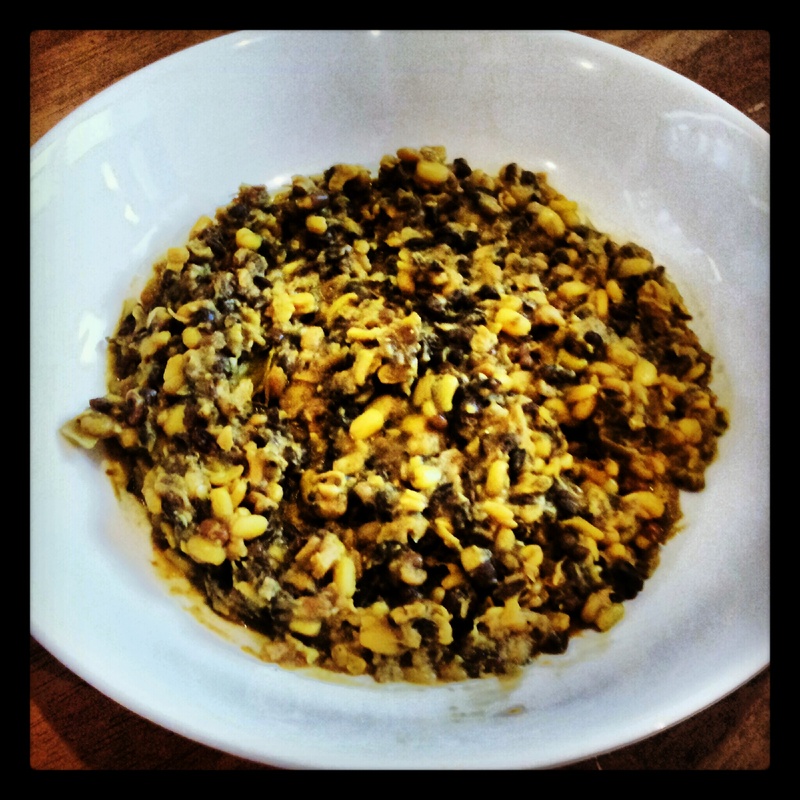 Add to the mixed black dal for extra flavour.